Download "Some questions. What s next? What is the TMA? Why a TMC? What will the Chicago TMC do? What s done so far? Existing systems Related projects"
1 Some questions What is the TMA? Why a TMC? 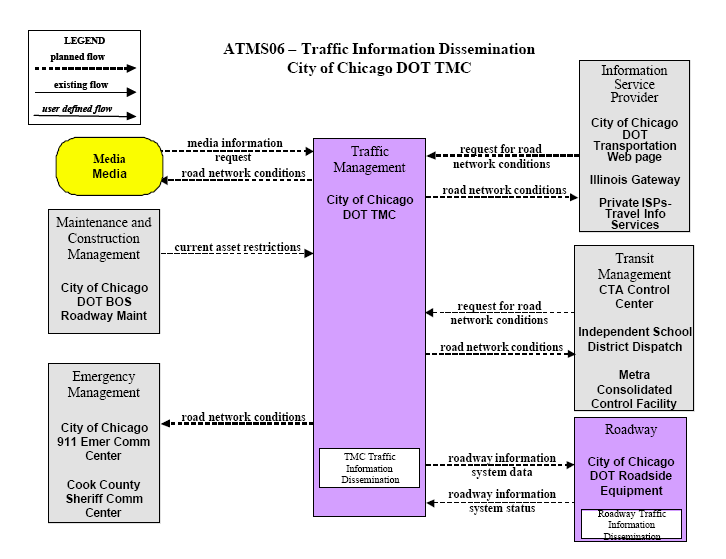 What will the Chicago TMC do? What s done so far? Existing systems Related projects What s next? 23 Traveler Information Tools Broadcast Media Dynamic Message Signs Highway Advisory Radio Subscription Services, Alerts Mobile, Wireless Services Internet Go to: Traffic & Transportation and Travel & Transportation for Traffic Advisories, Street Closures, etc. 40 ATMS = 13 Subsystems 1) Incident Management Subsystem (IMS) 2) Video (CCTV) Subsystem 3) Variable Message Sign (VMS) Subsystem 4) Highway Advisory Radio (HAR) Subsystem 5) Map Display Subsystem (MDS) 6) Alarm Emergency Management Subsystem (AEMS) 7) Data Warehouse Subsystem 8) External Input Subsystem 9) External Output Subsystem 10) Workstations Subsystem (GUI) 11) Administrations Subsystem (Login, Permissions) 12) Traffic Signal Subsystem 13) Arterial Performance Monitoring Subsystem (APMS) Others? 42 Project: Chicago Unified Command Vehicle Project Lead: City of Chicago Office of Emergency Management and Communications Project Team: MorganFranklin Corp. E-One Corp.
wavetronix TM 8 The Command DataMonitor plug-in is a solution for monitoring traffic-related hardware and software systems, and can be accessed and managed using any networked Web browser as the user interface.